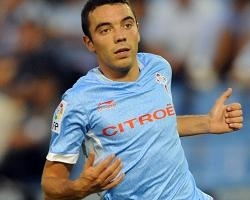 Celta Vigo striker and one of Spain's hottest prospects right now Iago Aspas denied that he's reached a personal agreement with Valencia CF, saying that there was big interest from several clubs in the winter transfer window, including Valencia CF, but that he hasn't signed any agreement with Valencia CF. Whether this is true or not we don't know, just remember last year Guardado also denied hawing reached a personal agreement with Valencia CF, though of course he had and later come out he had signed an agreement all along. So we don't know exactly what is going on and it can also certainly be true that Valencia CF hasn't in fact reached an agreement with him, although many sources claimed this was the case.